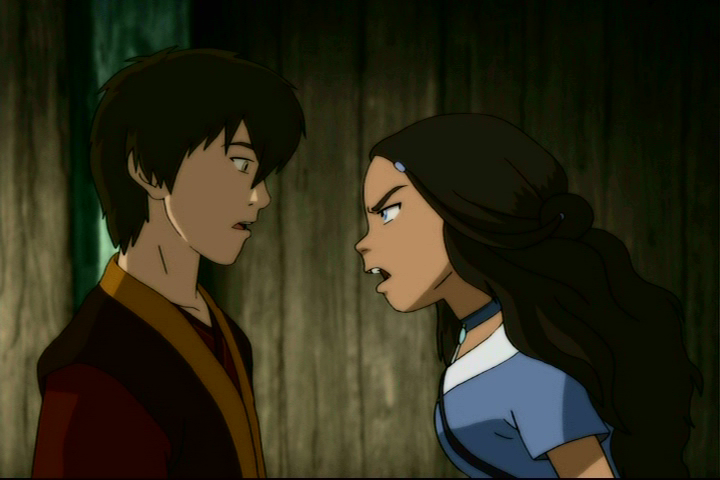 Kiss My Wonder Woman: Avatar: The Last Airbender Asks "How Dark Can A Kid's Show Get?" Avatar: The Last Airbender Asks "How Dark Can A Kid's Show Get?" Well readers, this is it. As of this posting (and a couple of days ago, actually, but who's counting) I have officially become one of those people to have actually seen all of Avatar: The Last Airbender. Yes, it was amazing, and yes, I also am surprised that it took me this long. I mean, I completely understand why, since it's me and my motives are not obscure to myself, but you get the point. It's a very good show and totally up my alley, and if it weren't for a number of extenuating circumstances I totally would have watched it before now. I just...didn't. Until now. Until my roommates borrowed a full set of DVDs and basically sat on me until we finished the series. There's a lot of stuff in here that I knew about going in. I mean, I knew the basic plot from the get-go. It's all explained in the thirty second intro at the beginning of each episode: "Water... Earth... Fire... Air. Long ago, the four nations lived together in harmony. Then everything changed when the Fire Nation attacked. Only the Avatar, master of all four elements, could stop them. But when the world needed him most, he vanished. A hundred years passed and my brother and I discovered the new Avatar, an airbender named Aang. And although his airbending skills are great, he still has a lot to learn before he's ready to save anyone. But I believe Aang can save the world." I wish I could say that I wrote that whole thing from memory, but I actually just copied it from the wiki. Anyway. That sums up the premise for the show. There's this world with four different cultures and forms of superpowers. They are led, at least nominally, by the one person in all the world who can control all four elements and has pretty much all of the superpowers. This person is reborn into each generation and can take basically any form. Everything's all hunky dory until one day the leader of the Fire Nation goes bonkers and decides that the world would be better if everyone were Fire Nation instead of having all of these silly "differences" and "cultures". So he leads the Fire Nation on a bloody rampage, kills the current Avatar (main superhero person) and waits to find out who the next Avatar will be so he can kill them too. Unfortunately for the Fire Lord and fortunately for literally everyone else, the new Avatar is an impetuous and ridiculous little boy. Faced with the stress and responsibilities of becoming the next Avatar, Aang, said little boy, sprinted away from his responsibilities and got himself frozen in ice for a hundred years. He saved his own life, sure, but his absence meant that the Fire Nation essentially destroyed the rest of the planet looking for him. This is all backstory, by the way. The main story of the show picks up a hundred years later when Katara (the one giving all that nice starting narration) and her brother Sokka find Aang frozen in the ice. They decide to help him on his quest - to defeat the current Fire Lord in the next year and in so doing save the world - and stick by him on an epic journey. There are other friends and foes along the way, of course. Zuko, the banished Fire Nation prince who wails about his honor a lot, and Toph, the terrifyingly powerful earthbender in the body of a blind little girl, are personal favorites. But the whole thing is basically a buddy quest movie. Watch all the friends save the world with the power of friendship and love! Yay! And that's not an inaccurate characterization of the show, either. Like, it literally is a show about a group of friends saving the world with the power of friendship and love. It's just also, and how do I put this nicely? So freaking dark. I mean, obviously this wasn't going to be a super light happy show, since the actual title refers to a mass genocide committed before the series even takes place*, but I was honestly shocked by how dark it could and did get. Yes, tumblr spoiled me on a lot of stuff, but the really deep stuff I had no idea about going in, and personally, I think that's great. SPOILERS for a show that's been off the air since I was in college. The first few seasons of the show deal with some pretty intense stuff, but it's not until the third season or so that the show goes full sale dark. While we'd already been introduced to the concepts of just war theory, ends justify the means political strategy, and dehumanization of the enemy, what makes the third season super dark is that we start to see this sort of thinking turn up in the good guys. 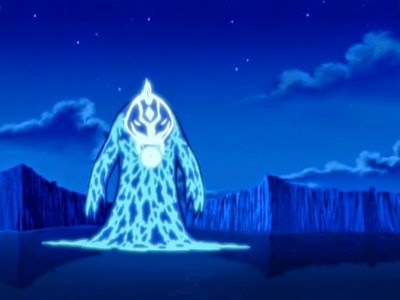 The central crux of the third season is the dawning realization that Aang must stop the Fire Lord before he gains extra power and uses it to exterminate all other races than his, and that the only way Aang can see to do this is to kill the Fire Lord. Aang, a pacifist, is naturally against this. I mean, he's a vegetarian for crying out loud! But there honestly doesn't seem to be any other option. It's either killing the Fire Lord, something even his son thinks is necessary, or allowing the Fire Lord to commit mass genocide. If this concept as the season arc doesn't shock you, then I think you've not properly thought it through. Remember, this is a children's show. Our hero, the adorable pacifist being told he must murder a man to save the world, is twelve. He's the twelve year old survivor of a murdered race being told he must take bloody vengeance on a man that everyone knows is mentally unstable for the greater good. And while this cheery plotline is carrying on, we're also treated to storylines about a waterbender so strong she can actually call the water in a person's body and use people like puppets. Or a plot where a teenage girl tracks down her mother's killer, or another plot where the kids deal with systematic brainwashing and secret police, or another one where they tackle ingrained institutionalized racism, or one about euthanasia... It's not an isolated incident, is what I'm getting at. While the series finale has some of the darkest episodes, it's by no means an aberration. It's a dark freaking show. But it is a show for kids. Demographically the show is aimed at children ages six to eleven and aired on Nickelodeon. It is unequivocally children's programming, even if it is incredibly popular with adults all over the world. It was made for and about kids and I find that very interesting and honestly, very good. I know that last bit is a little weird, but bear with me. Rather than finding all of this darkness and intensity off-putting in a children's show, I actually find it really encouraging. I think it's great. Not because I'm somehow dead inside and I want everyone else to be as dead as I am - though that might very well be true - but because I think it is incredibly valuable for children to be able to see on screen characters like them making really hard decisions and then living with them. Think about it. If all we ever show kids is "appropriate" media, where the stakes are low and the hardest decisions involve a character figuring out what they'll have for lunch, then our kids aren't going to have a good visual for what it means to make a really tough decision. Sure, ideally they're going to learn that from us, from the people around them, but what about the kids who don't? What about the kids whose parents don't share that kind of information, or who don't have parents, or who need another role model for whatever reason? It matters because in this little, silly show, we see children wrestling with the hardest questions that human beings can face and it's not easy. It's dark, hard, and true. I love that because it's so honest. Making a tough decision, especially a tough moral decision, is really hard. It's hard even when you have lots of experience and are comfortable with yourself and your beliefs. But it's super hard when you don't know how to deal with the emotional fallout or the possibility that you could be wrong. Aang's choices, and the stories of all the rest of the gang, help kids see how to make a really intense choice, and then how to deal with the fallout. Ideally, none of our kids are going to grow up to have to make the choice on whether or not kill a crazed warlord, but that doesn't mean that the darkness in this show is over the top or unnecessary. It's not. The problems Aang faces are different than the problems we face, but knowing how he made his choice and knowing how to reason through our own is a vital skill, no matter the scale of our lives. And sure, I was pretty genuinely freaked out after some of these episodes - particularly the bloodbending one, because that was horrifying - but that's okay too. It's all right to be scared sometimes, and it's all right to expose children to media that might frighten or alarm them. Why? Because they're going to be frightened and startled by lots of things in their lives, and if you shelter them too much, they're probably not going to know how to deal with it later. I'm not saying that small children should be watching Saw or something, but I am saying that part of raising children to be good citizens and functional people means making them aware that things aren't always as easy as they have (ideally) had it. Exposing them to the darkness in the world and showing them how to fight it. It's not fun, but it's like getting a vaccine. Give them a touch of darkness now and teach them how to combat it later in life. 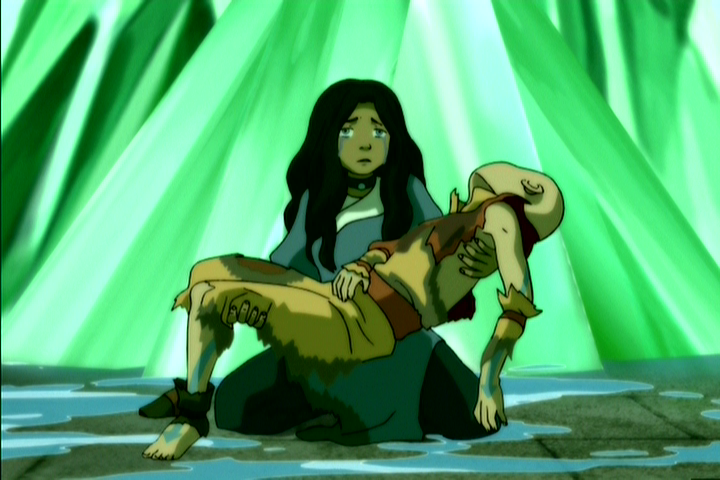 I'll probably have more thoughts on Avatar: The Last Airbender as time goes on, but this was the first one that popped into my head: Damn, this is dark for a kids' show. Followed immediately by another thought: Thank goodness it is. This is not to say it's all doom and gloom. There's some very good comedy in there too. Somewhere. 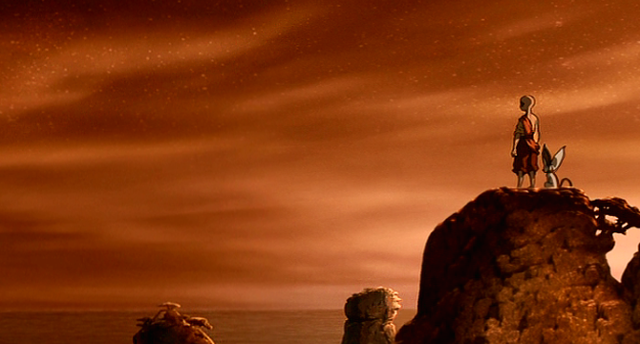 *Aang, our hero, is the last airbender because the Fire Lord killed literally all of the rest of them looking for him. Eeugh. 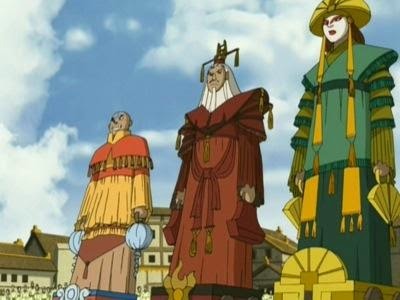 It's a shame that we had such a gap between when we watched the first couple episodes and when we picked it back up, because I imagine you might also have wanted to mention that moment within the first few episodes where Aang returns to his former home to find the SKELETON of his beloved friend and mentor lying waiting for him. Yup, I did completely forget about that part. I mean, the whole beginning of the show is pretty intensely traumatic. But I had forgotten that detail. Even in the first season we learn that Zuko's exile was down to him opposing the needless spending of troops' lives - and that his father scarred half his face to remind him of the "lessen." In other words it shows us abuse; and it carries a grounding for when hard choices are a necessity and when the phrase is a shield for convenient ones. And while Zuko gets a tragic backstory, and a redemption arc in the second half of the series, these are never used to excused the actions he carries out in the first half. There are many *adult* shows that don't manage that. Another thing I like is that Toph's metalbending is something explicitly *invents* - not a special power she has, or something he got from a dead mentor. Ooh, yeah. Good point. We do get pretty clear storylines about parental abuse early on. And I love that they never excuse his actions or even let the audience forget them. Like, yeah, Zuko's good now. But he did some really bad stuff and he doesn't get a free pass on that. 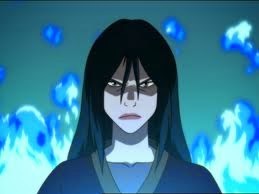 Toph's metalbending is the coolest thing ever. It's not something anyone taught her, and it just proves that she's the greatest earthbender pretty much ever. Which is a very radical statement for a television show to make about a little girl. I know this is an old post but I thought the darkest line is where Toph figures out that she can control the iron in someone blood. Imagine the possibilities of that. Nice! I can make my kids watch this movie. They are already going to finish watching Andrew Yeatman shows on Netflix. I want that they learn good things from these shows and that is why I literally hunt for good shows online. This is a nice and informative post.